Sodium chloride, or salt, represents an important mineral essential for life-sustaining biochemical processes including fluid balance, blood volume, nerve impulses, muscular and cardiac functions. All humans require small amounts of salt in their daily diets; however, excess consumption increases the risk of high blood pressure and cardiovascular diseases, even in children. The recommended dietary allowance for salt, established by the Institute of Medicine, varies according to a child's age. Salt is the combination of 40 percent sodium and 60 percent chloride. Nutrition labels on packaged foods generally contain the sodium content of the food item. Too much in your child's diet increases the risk of health complications. Determine the total salt content of a food item by multiplying the serving of sodium by 2.5. For quick reference, if you use table salt in your cooking or at meals, the sodium content of 1 teaspoon of salt equates to 2,000 milligrams of sodium, while 3/4 teaspoon of salt equals 1,500 milligrams and 1/2 teaspoon of salt equals 1,000 milligrams of sodium. The recommended dietary allowance for children ages 1 to 3 is 1,000 milligrams of sodium per day, or 2,500 milligrams of salt. Children ages 4 to 8 should consume 1,200 milligrams of sodium per day, or 3,000 milligrams of salt. The daily recommended intake for children and adolescents from ages 9 to 18 years old is 1,500 milligrams of sodium, or 3,800 milligrams of salt. The American Heart Association recommends that everyone limit sodium consumption to 1,500 milligrams per day. 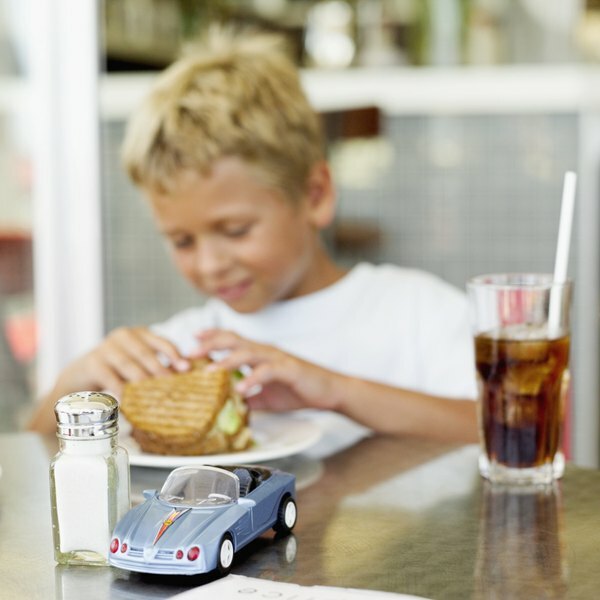 Excess consumption of salt in a child's diet is linked to the increased risk of obesity, high blood pressure and cardiovascular disease, according to a cross-sectional review published in 2008 in "Hypertension." Children are exposed to a variety of convenience foods containing high sodium including soft drinks, breakfast cereals, processed meats, frozen foods and junk snacks. The inclusion of many of these types of foods in the school environment prompted the Centers for Disease Control and Prevention to implement an initiative to cut down on sodium in school lunches. Parents can further promote healthy food choices by avoiding frequent fast food meals and giving their kids fresh fruit and vegetables rather than packaged snacks. Hypertension: Salt Intake, Hypertension, and Obesity in Children; Feng J. He, et al.